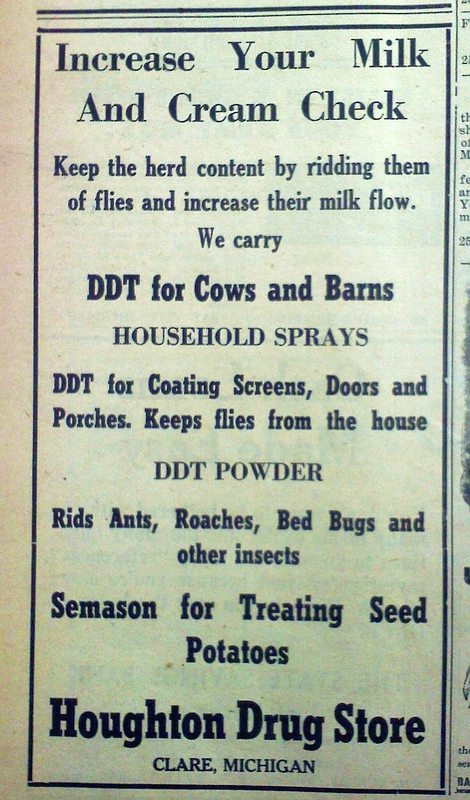 A Little DDT With Your Milk? I was looking through some back issues of the Clare County Cleaver, a local newspaper with offices in Harrison. The folks at the office are always very open to allowing me to go through their archives. They don’t even ask if I’m a resident and/or subscriber (I am both). Anyway, it’s fascinating to look through the papers, to read the stories and look at the old ads. I was perusing some issues in 1946 the other day to get some information about a fatal plane crash at the airport in Harrison when I came across this ad so I took a photo. How things have changed in the intervening decades.